We should always strive to be as energy efficient as possible in every area of our home. This includes our windows! Energy efficiency is a multi-faceted concept that benefits both the environment and your pocketbook; according to ENERGY STAR, by decreasing our overall energy usage, we release fewer greenhouse emissions into the air and save on monthly energy costs. This seems like a win-win, right? 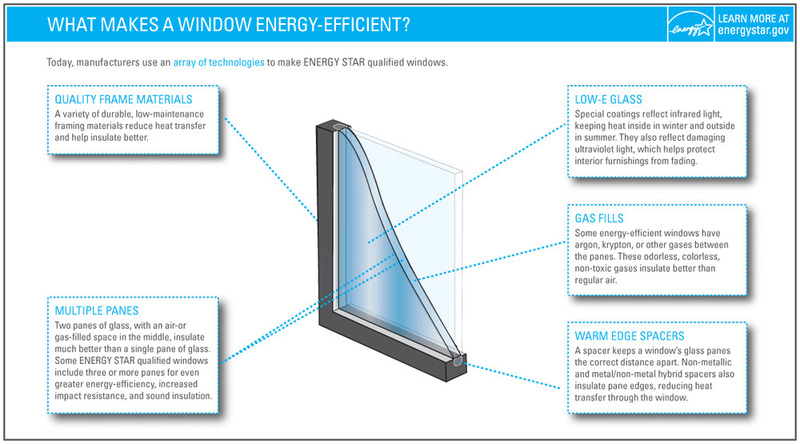 If you’re in the market for new windows, consider the benefits of energy efficient models. So, what makes a window energy efficient? For the best assurance that your windows are energy efficient, look for the ENERGY STAR logo. ENERGY STAR is a program designed to promote energy efficient products and is backed by the Environmental Protection Agency (EPA) and the United States Department of Energy. The criteria used by ENERGY STAR to qualify products include: they have to be manufactured by one of their partners; they must be tested, certified, and verified separately by the National Fenestration Rating Council (NFRC); and the ratings from the NFRC have to meet those put in place by the EPA. If a product meets all of these measures, they receive the ENERGY STAR seal of approval. Multiple panes in each window – In some cases, there are more than three! This not only helps insulate the home for energy efficiency, but it also makes the window more resistant to impact and can help insulate from sound. Warm edge spacers – In between each of the panes, warm edge spacers keep each pane the correct distance apart and help with insulation. “Low-e” glass – This is low emissivity glass. Low emissivity glass is covered in layers of metallic oxides that we can’t see. The point? Low-e glass can help reflect UV light that damages furniture, carpeting, and can even burn our skin. It also helps control temperature, which makes a difference season to season. Frame efficiency – An ENERGY STAR approved window will be efficient down to the frame, and the type of materials used will also serve a purpose, like reducing the transfer of heat. Fiberglass, aluminum, and wood are some materials used. Gas fills – Some windows will have gas fills between the actual panes for the purpose of insulation, though this doesn’t apply to every single ENERGY STAR window. At 1-800-HANSONS, being energy efficient is one of our top priorities. We know it benefits our planet and our clients! This is why we offer energy efficient windows of all shapes and sizes to achieve your vision and make a difference. Contact us today to see for yourself. Previous Post:How Will New Attic Insulation Affect My Energy Bills? Next Post:What Are Some Home Improvement Projects for the Winter?